TSRJC CET 2019 admission counselling guidelines, instructions, remuneration, expenditure: TREIS TSRJC CET 2019 Admission Counselling Schedule notification has been issued by the Telangana Residential Educational Institutions Society(TREIS), Secretary for admission into inter first year in 4 Telangana State Residential Junior Colleges(TSRJCs) for the academic year 2019-2020. 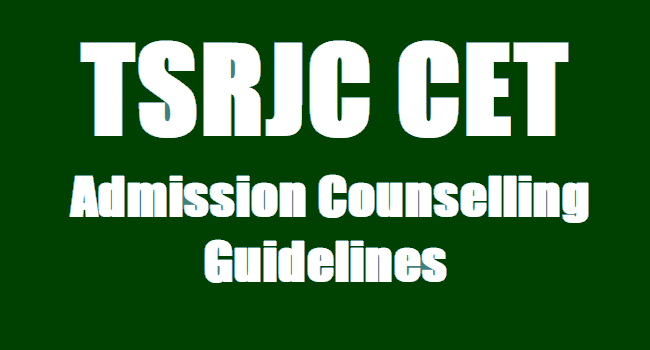 In this connection TREI Society Secretary has issued guidelines and Financial Norms to the TSRJC 2019 Admission Counselling Committee Members and TSR Junior Colleges for Conducting of Counselling as per schedule. Following guidelines are to be followed in conducting of counselling. 1. The committee should go through the Information bulletin of TSRJCCET-2019 and understand the rules and other information before the commencement of counselling. 2. Instructions issued above to the candidates are to be observed by the committee in filling up the seats. 3.The registration of candidates attended for counselling shall be taken up from 9.30am to 1.00pm. 4. Verification of certificates are to be taken up simultaneously. After satisfactory verification of certificates i.e. SSC marks, Caste, special reservation category, study certificate and T.C., the eligible candidates in each category shall be listed to call for counselling. 5. Verify the certificates pertaining to the category of vacancy in which the candidate is shortlisted. For example, if a candidate is shortlisted against the CAP( Children of Defence personnel) vacancy , then the candidate has to submit the certificates to that extent as he/she has mentioned the special reservation category in the application form and selection was made on that information . Similarly in the case of other reservation categories also same procedure is to be followed. 4. If any candidate fails to submit the relevant reservation category certificates, then He/she will not be allowed to participate in the counselling. 6. Counselling shall be commenced at 2.30pm, Following is the order of priority to be followed in calling the eligible candidates. 7. While calling the candidates for counselling under the reservation categories, the left over candidates under Open Category shall be called first in their respective category of seats and after exhausting the list of leftover candidates only, the candidates listed in reservation category of that particular category shall be called. 8. While filling the vacancies under PHC/CAP/Sports category, if there is any candidate left in that category in open category list, such candidates are to be called before the candidates listed under that reservation category are called. 8. The candidates whose admission is finalised have to pay the special fee and maintenance charges as mentioned in the instructions apart from submission of certificates. The Principals of the Counselling centres are hereby instructed to provide accommodation, Drinking Water facilities and mess to the students and parents during theirstay for admission. They may be permitted to provide Breakfast, Lunch and Dinner by issuing Tokens. The Rate for Breakfast is to be fixed as Rs.10/-, for Lunch and Dinner Rs.20/- each. T.A. and D.A. for journey period to the Committee members and other staff drafted for counselling will be allowed as per APTA rules in vogue. 1.Money given to the student for the purchase of Text Books, Note Books, Record Books etc . and pocket money should invariably be deposited with the LocoParent allotted by the Principal of the college concerned. 2.No student is allowed to bring Cell Phones, Tape Recorders, Radio, Electric Heaters Iron Box and such other goods. If noticed the same will be seized and will not be returned even after completion of the course. 3.The Parents are advised not to send the students with valuables to the college and if any loss occurs they alone are responsible and further the student is liable for disciplinary action. 4.No student should leave the campus without obtaining proper permission from the Loco-Parent and the Principal under any circumstances. The Parents are advised to visit the campus only on Sundays to see their children and can call on Phone only on Sundays to the college Phone.No student will be called to talk on Phone on the working days. In case of emergency they should contact the Principal. 5.They should not participate in the local celebrations out side the campus and should not go for swimming in the Ponds or tanks. 6.They should strictly adhere to the rules and regulation of the College and instructions given by the Principal from time to time and should maintain utmost discipline. Ragging in any form is strictly prohibited as per Law and any violation is punishable.